There is a quite rich and diverse literature on the city and province (vilayet) of Van, which is differential in as far as the importance of information and its trustworthiness are concerned. Naturally, it would be impossible to assemble and represent information put forth by all these sources, but we tired, as much as possible, to get a hold of the most fundamental sources which have been written by eye witnesses. Amongst such literature, the works of Karekin Srvantsdiants, Yervant Lalayan, and Hampartsum Yeramian stand out. If the first two of the above mentioned, are works of a more ethnographic nature, then Yeramian’s two volume monograph is in sorts a biography about his birthplace conveyed in an enthusiastic and immediate manner, which at the same time communicates interesting information about various aspects of public and social life in Van (from the 1820’s till 1915). This work, bearing the monumental name of “Hushartsan” (Monument), begins by listing praises bestowed by visitors describing the landscape of Van . The people of Van themselves did not fall short of praising their legendary nature, “Heaven in the sky, Van on earth”,  “Van on this world, the kingdom of paradise in the other” . Through these proverbs, the locals, with their slightly exaggerated taste for boasting, express their longing for their lost homeland. The symbolic representation of the actual or the mythical riches of this land is given through the folk tale of the old lady who used to pour yoghurt-drink off the walls of the Van fortress . It is said that the Persian Tahmasp Shah besieged the impregnable fortress of Van for seven years but seeing, on several occasions, that an old woman pours yoghurt-drink from the walls of the fortress, he loses hope and retreats from Van. The southern part of the province features the Gortvats (Zakrosh) mountain range, covered by fruit trees as well as wild trees, while the northern and the eastern parts besides having grazing hills also feature wide and fertile flat lands. Various kinds of roots and fruits  grow in the eastern provinces. The southern provinces are thick with forests (oak, Norway maple, hornbeam, asp, as well as rose hip bushes) . The Van vilayet is a mountainous region rich in a variety of mines. In the beginning of the 20th century, Yeramian writes that the mines of the Van vilayet are still “virgin and unexploited” but it is known that there are coal, petrol, chalk, arsenic, copper and iron mines which are abundant in the mountainous regions. It is also known that traveling scientists have discovered traces of gold and silver mines in some parts of the south-eastern mountains . If we list by province, the Pergri province has petroleum supplies, while Ardjag and Shadakh/Çatak have coal. There is iron in Djulamerik, sulfur in the Ardjag and Ardzge/Adilcevaz provinces, and asphalt in Mugs/Müküs. The other provinces are also rich in mines - the Timar province is rich in construction materials . Armenian sources often refer to the Van vilayet as the Van pashaluk (paşalık), the Van prefecture or the Van province. The administrative center is the city of Van. Prior to World War I, the Van vilayet stands at an area of forty thousand square kilometers divided into two sandjaks, each of which in turn are divided into various kazas and nahiyes. The number of the latter varies depending on different periods in time. As is the case with the word vilayet, Armenian sources use different wording to describe geographical entities within Van giving way to considerable confusion. To avoid such confusion, in our text we have adopted the following wording: vilayet –province, sandjak – sub-province, kaza – district, nahiye – sub-district. The borders of the Van vilayet are: Aderbadagan from the east, which is the Iranian Magu, Khoy and Salmas regions (the Noshiragan world of the historical Armenia); from the north, west and south Van respectively boarders Erzurum, Bitlis and the Mosul vilayets. At the center of the Van vilayet is the historic fortress of Van which overlooks the salt lake or the “sea” of the same name. The eastern kazas of Bitlis (Khlat/Ahlat) and Tadvan extend till the lake and for this reason their natives often like to say that they are from Van . Van would sometimes be considered as part of the Erzurum state as a mutasarrif and sometimes as an independent province only reporting to the Istanbul headquarters as was the case following the 1877 Russian-Turkish war . Until the mid-nineteenth century, Ottoman sources also referred to the Van prefecture as Ermenistan. As a separate regional administrative unit, the Van vilayet emerged in 1549 and included the main counties of the Vasbouragan region of historical Armenia such as some parts of the Mogk, Gordjayk and Duruperan worlds. It consisted of separate districts, which in turn were made up of separate counties, and the later were divided into kazas. Until the first half of the 19th century, Van included the following kazas : Ardzge/Adilcevaz, Yeghekis/Yeğekis, Ardjesh/Erciş, Pertagh/Namiran, Pergir, Zregan/Zrigi, Ekradi bin-Gotur, Khizan/Hizan, Khlat/Ahlat, Gargar, Ketsan/Kazani, Mush, Shirvan/Şirvan, Sbargerd/Ispayert, Van. In the 16 -17th centuries, Bayazit was also included in the Van vilayet, which at the beginning of the 18th century becomes a part of the Erzurum vilayet . In 1834, a considerable part of the Van vilayet is attached to Erzurum while Mugs/Müküs and Hakkari are attached to the Diyarbekir vilayets. Until the 1840’s, there were Kurdish semi-autonomous authorities (hükümetler)  within the Van vilayet. At the end of the 1840’s, following the elimination of the Kurdish hükümetler, the Van vilayet is dissolved and is temporarily attached to Diyarbekir or the then called Kurdistan (1848-1850), and later on to the newly established Hakkari (1850-1855) vilayets. Some south-western parts are included in the newly established Bitlis vilayet. 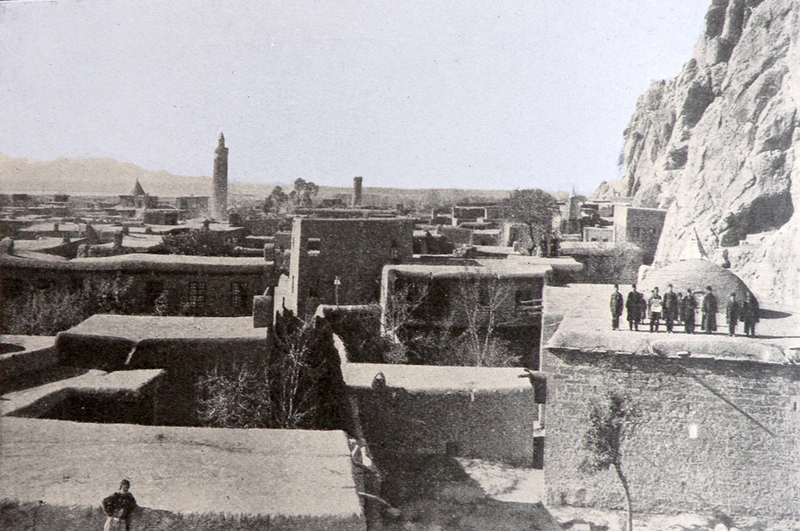 Van, Hakkari, Djezire, and Mardin form a separate vilayet together. In 1867-76 the Van vilayet region becomes part of the Erzurum vilayet (the former Ermenistan vilayet) . In 1877, the Ottoman government restores Van as a vilayet but changes its area, considerably diminishing it. In 1880, Hakkari becomes an autonomous vilayet, and before 1884, the Mush kaza and the Sbargerd/Ispayert, Khizan/Hizan, Shirvan/Şirvan and Gardjgan/Karçikan nahiyes become part of the newly established Bitlis vilayet. However, in 1888 Hakkari and Gardjgan/Karçikanare permanently joined the Van vilayet. In 1893, the Amadya nahiye is excluded from the Van vilayet. In the coming years: in 1891, 1897, 1902 and 1913, the internal administrative structure of the Van vilayet also undergoes major changes . 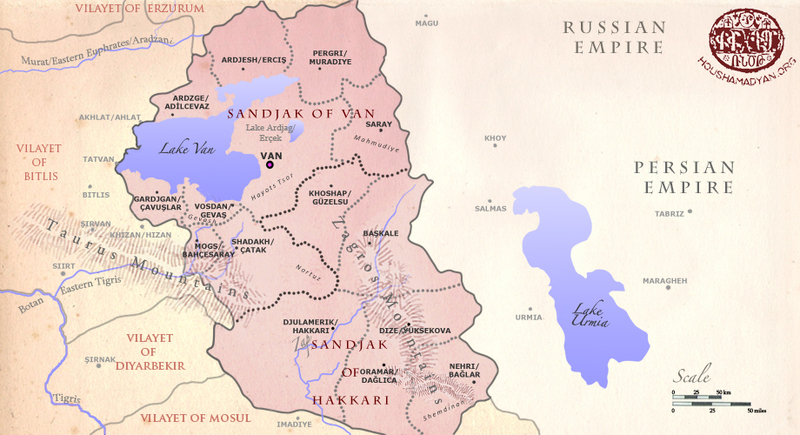 On the eve of World War I, the Van vilayet had two sandjaks: Van and Hakkari. From the northern side it bordered Erzurum, from the west, it bordered Bitlis and Diyarbekir, from the south, its neighbors were the Mosul vilayets and from the north, Iran . The Van sandjak area is 22.700 square meters (of which 5.454 square meters is the area of Lake Van) . In 1914, 92.7 % of the Armenian population of the vilayet lived in the Van sandjak. 103.432 Armenians occupied the nine kazas of the sandjak: Van, Pergri, Ardjesh/Erciş, Ardzge/Adilcevaz, Mahmudiye, Gevash/Gevaş, Gardjgan/Karçikan, Mugs/Müküs and Shadakh/Çatak . The Van sandjak (center, the city of Van) occupies the vilayet’s northern and north-eastern as well as Eastern Tigris/Dicle (Bohtan) River’s upper flow regions. Prior, it appears that the Gardjgan/Karçikan kaza was part of the Gevash/Gevaş kaza as a nahiye, while Mugs/Müküs was part of Shadakh/Çatak and Gevash/Gevaş. And therefore, the kazas of the Van sandjak were the following: Ardzge/Adilcevaz, Ardjesh/Erciş, Pergri, Gevash/Gevaş (historically Vosdan/Reshdunik including the Gardjgan and upper Gargar nahiyes), Mahmudiye or Khoshap (Karasu nahiye), Norduz (historically Antsevatsik, renamed Mamuratul-Reshad in 1913), Shadakh, and Van. The here mentioned Van kaza covered the areas surrounding the city; the previous Vandosp kaza as well as the Ardjag, Timar and Hayots Tsor nahiyes . Pergri later went from being a kaza to being a nahiye, while the Gargar, Ardjag, Timar and Hayots Tsor nahiyes were previously separate kazas. As for the Norduz/Antsevatsik and Khoshap kazas, they later became part of the Hakkari sandjak . If we count the Van sandjak regions according to their geographic locations in relation to Lake Van, then Van and its adjacent dwellings would fall east of the lake, Timar to the north-east, Hayots Tsor, Norduz, Aghpag, and Djulamerik to the south-east and Rshdunik (Gevash/Gevaş), Gardjgan/Karçikan, Gargar, Mogats Yergir, Khizan/Hizan, and Shadakh to the south of the lake. To the west of the lake would be Tadvan and finally to the north and far north-east of the lake would be Akhlat/Ahlat, Ardzge/Adilcevaz, Ardjesh and Pergri . Ankgh/Engil (current Dönemeç) – 678 Armenians (108 households), has the St. Asdvadzadzin (holy Vergin) monastery and the St Krikor (St Gregory) church. The city of Van is situated to the east of the Lake Van at a distance of 2-3 km from its shores (20 min walking distance) . The city is sheltered by the lake on its western front, and by the eastern part of the Taurus mountain range on its eastern front. 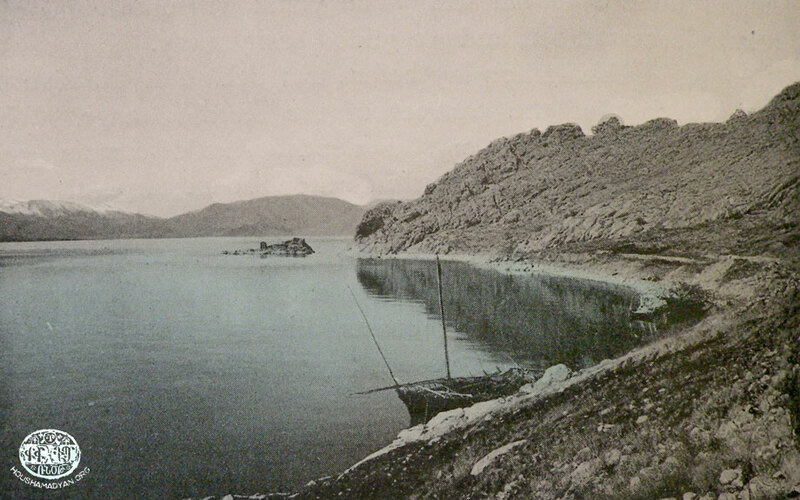 The city of Van is connected to the Lake through the Avants village (currently Iskele), which being right on the shores of the lake serves as kind of a port. Being situated on flat land, the climate of the city of Van is dry and warm. At the same time, winter lasts for 4-5 months. The city has fertile agricultural land, lush fruit orchards, abundant irrigation and drinking water , which is not of a very high quality . Throughout history, the city of Van has seen various earthquakes (1276, 1441, 2 April 1646, 1648, 1649, 7 March 1701, 13 January 1704, 8 march 1715, 1791) and famine (1606). The 1648 earthquake was especially devastating, as it destroyed whole neighborhoods, many churches and mosques, and historical monuments . A mountainous cliff emerges at the center of the City of Van, which is home to the Urartian citadel. 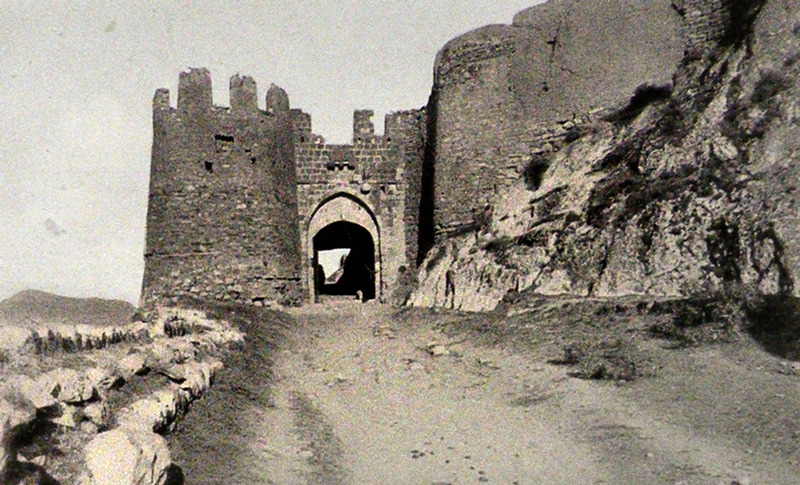 This is also where the main entrance of the city is, which is known as the Tabriz gate (Tabriz Kapı). To the east of the city is the Varaka Mountain with two churches of the same name: the Old and the New Varaka monasteries . To the north-east of the city are the Toprakkale heights (the Urartian Rusahinili fortress) where excavations have produces many antiquities. These heights are home to a number of important places as is the Agrpi (or the Akrav/crow) cliff, the gate of Mher, the Zemp-Zemp maghara (cave), and the Dzrdod rock to which local traditions are related . 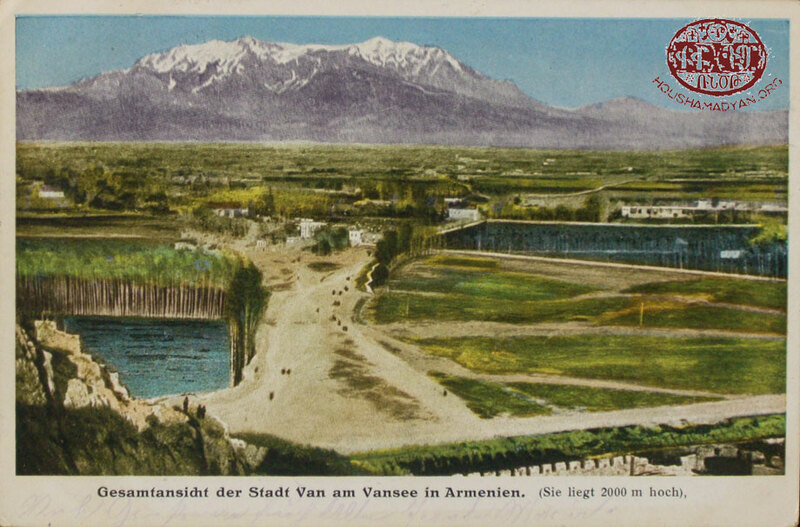 The biographer of his birthplace, Hampartsum Yeramian (born 1857), having lost his sight at the age of 11, had a vivid memory of the fairytale scenery of Van, which had impressed his youthful imagination. 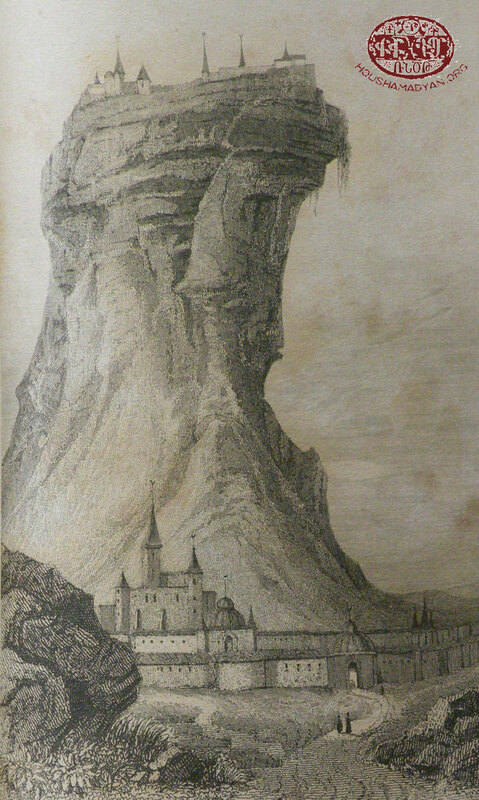 In the first volume of his monograph “Hushartsan” (Monument), he recalls the nature of Van he had seen at the age of five: “I would stand on top of a cliff with my back to the Varak and would watch the gigantic panorama: the western side. From the right the horizon is divided by the St. Krikor church and towards the west the caravans of the Agrbi hills with their bride and groom peaks reaching the seaside. From the left side, the Shoushantsi Mountains and the St. Khach (cross) hills separated from the Shoushantsi Mountains by a small valley, also touching the sea side. This sight comprised a large arch encompassing not only the field but also the Aykesdan of Van which from afar looked like a monotonous giant emerald. Through the green and the mirror-like blue of the sea emerged the historical fortress of Van. To the west was the wide lake with its four islands and the surrounding mountains; the southern mountain range with its evergreen forests and Artos and Arnos peaks, almost always cover in snow; and the north-eastern side with the majestic Sipan with its white peak, enveloped in clouds. To the west of the lake the misty Nemrut and Grgur were barely outlined, whose detailed and enchanting description is passed to us through Srvantsdiants’ work” . 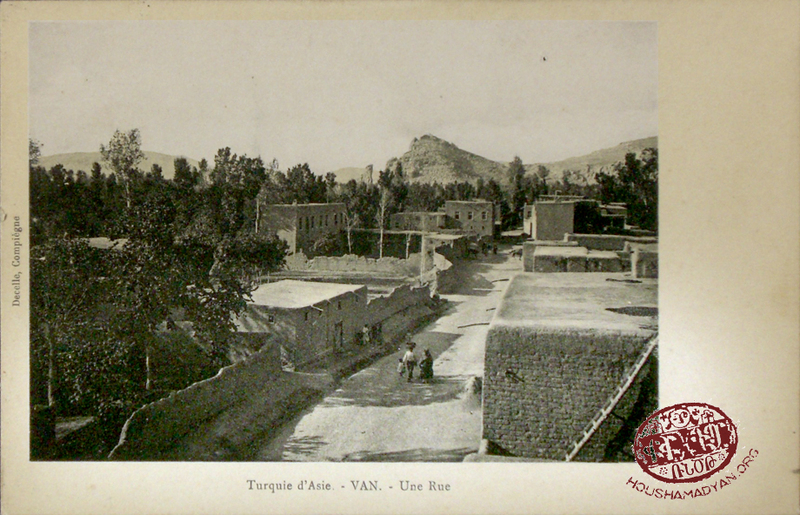 At the beginning of the 20th century, the city of Van had 5500 households of which 3000 were Armenian. The city was separated into two parts: the inner part (the main fortified city) and Aykesdan to the east, spread over extensively. Most of the houses were made of bricks, one storey, two storey and a few 3 storey buildings. The streets were narrow and crooked. 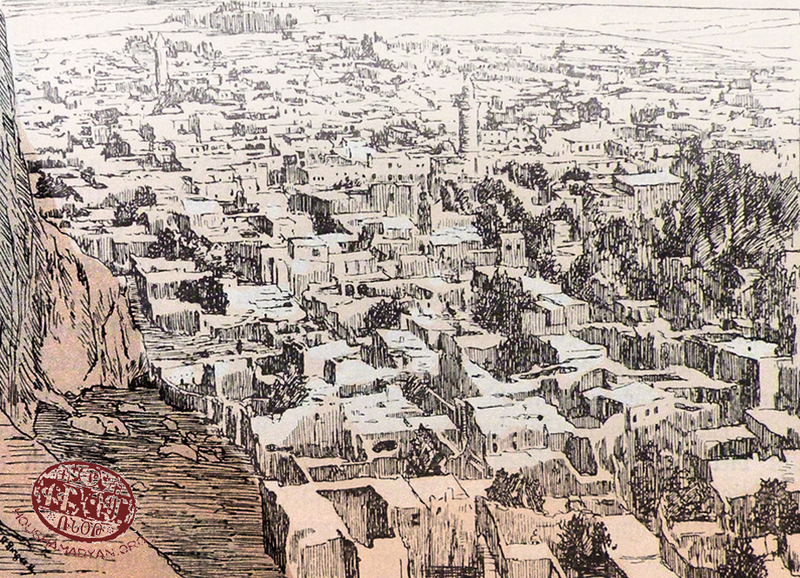 The Armenian populated part of the city was divided into 34 large and small streets, 31 of which have been severely damaged during the 1895 anti-Armenian mass violence. There were 12 Armenian churches: St. Diramayr (St. Mother of God), St. Boghos (St. Paul), St. Bedros (St. Peter) St. Vartan, St. Sahag, ect . The western part of Van is called the main city or the inner city. It is enclosed by fortresses from 3 sides and by the citadel to its north-east. 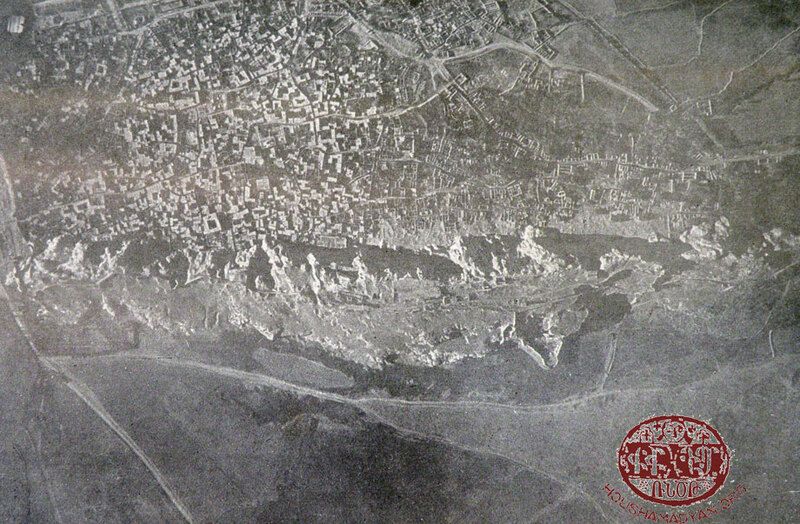 The city has 4 gates: Tabriz to the east, Yeni (new) or Saray to the south, Orta (middle) to the south and Iskele (harbor) to the north-west . The plan of the inner city is irregular with narrow streets, houses next to each other and poor vegetation. The craftsmen’s market, the house of governance, the police headquarters, the main mosques, the central prison, the post and telegram office, the Régie center, the main armory and the Armenian Prelacy are located in the inner city . Being in Van in 1880-1881, Servantsediants says that the government offices, the armory and the courts, all the marketplaces and the khans were located in the main city . 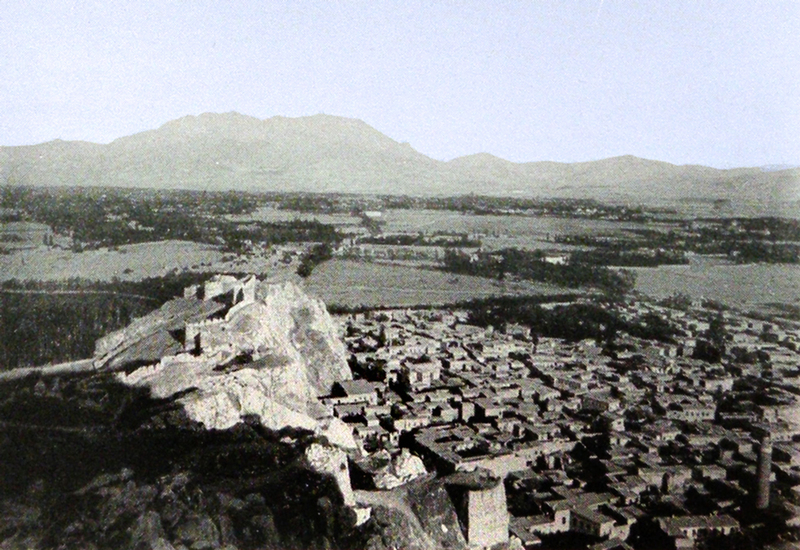 Prior to Srvantsdiants’ arrival in Van, Yeramian, who worked as a teacher in the main city of Van in 1874-1878 remembers that the place was divided into narrow and dirty streets and did not have a park or a garden. It was especially difficult to pass through those streets in the winter season because the snow would accumulate in those streets for 4-5 months, at places reaching till the roofs of one storey buildings. Snow often covered the doors and the windows of these houses forcing the residents to exit their homes on piles of snow or dig tunnels through it in order to be able to leave their houses and maintain contact with the outside world. According to Yeramian, during the unsightly winter months, people were forced to seek recreation within homes or in the warm but smoky cafes where they got carried away playing backgammon or cards . The eastern part of Van is rich in vegetation, has thick orchards and is called Aykesdan (Erkesdar, Erkesdara in the local dialect). The Turks also called it Baghlar . According to Srvantsdiants’ artistic description, “the Aykesdan of Van … through the efforts of its residents, is a decorated, blissful place, where each house has an adjacent grove, orchard and water springs in front of the threshold, on both sides of the street by the strands of brooks are orderly planted leafy willows, at places also poplars, Jack trees and Scots elms. In the middle of the street is the communal spacious road and the leafy arms of the branch-full trees embracing each other from its sides into a wonderful umbrella for the passers-by, through which the rays of the sun project themselves as flickering stars on the ground or on the heads and faces of people in passing or those sitting such as the cool of the moonlight, in a peaceful night, glistens the breeze at the bosom of the shallow waters of the sea side. The roots of these trees, whose green and verdure hair is anointed with the dune in the air and the warmth of the sun, flourish with the passing water and the water flow babbling, murmuring, licking the feet of the trees and irrigating everyone’s rightful grove and orchard; providing water for cleaning the houses, drinking and for all use that need be” . According to Srvantsdiants, Aykesdan extends over 4.5 km of roads and squares and one would need an hour to pass through it diagonally or vertically . The people of Van call the streets poghan and the squares of the main roads poghniklokh . The Khachpoghan Street, decorated with willows and poplars as well as the square of the same name are in Aykesdan. The other streets are irregular, narrow and crooked while the houses are clay-made and not very attractive. The British, French, Russian and Persian consulates, the Armenian Protestant School and the orphanage as well as the German, American and French missionary establishments are in Aykesdan. From governmental and public structures, Aykesdan is home to baths, market places as well as armories. According to the legend, Queen Shamiram of Assyria had built her summer residence in Aykesdan . The Armenian population of Ekesdara (Aykesdan) was in contact and in constant movement especially on important holidays like Paregentan and Vartavar. 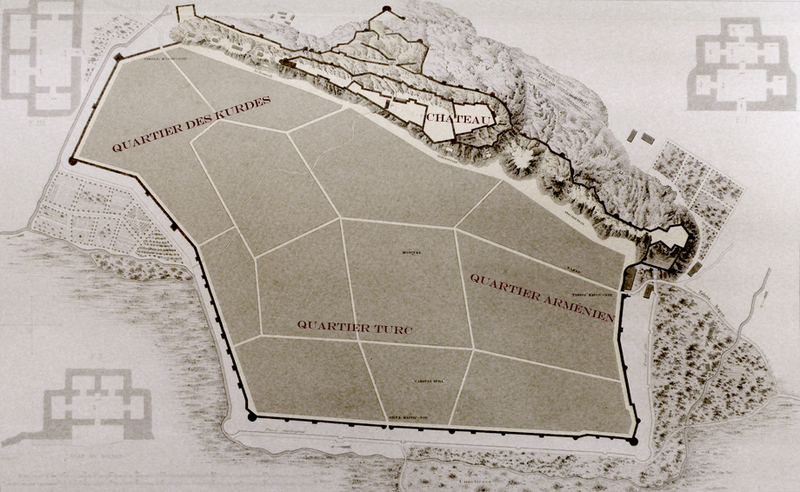 They occupied the larger part of the geometric square outline of the town which could be crossed on foot, from east to west (not taking into consideration the Turkish quarters which are at a ¾ hours distance) and from south to north at equally about 2 ½ hours. 2/3 of the approximate 40 thousand population of the city of Aykesdan were Armenians. This is without taking into consideration the adjacent villages which later expanded and became suburbs of the city . It appears that Aykesdan was a relatively new district, since Yeramian writes in his memoires that as a child, he remembered the elders of town telling that before, Aykesdan used to be a deserted field, which had although been a residential area in older times. As proof of this, people would discover tandoor-ovens (tonirs), khachkars (cross-stones), fundaments of dwellings as well as armatures, arrow heads and cuneiform writings while they ploughed the soil. But according to what Yeramian heard, in older times “only the southern part was prosperous, the part of the city called Shamiriam neighborhood, which extended eastwards from the seaside. This was possibly a suburb of Samiriamagert fortress that Khorenatsi (Moses of Khoren, 5th century) mentions, irrigated by Shamiram amble waters brought from Hayots Dzor; a distance of 6 hours by a well structured water channel. And for that reason it was gifted with such heavenly parks and gardens” . Yeramian’s sources inform that in older times, the districts expending from the inner city eastward towards St. Jacop (St. Hagop) (Verin and Varin Norshen) and the twin streets of Garoyian were also Armenian populated. The latter was owned by a rich Armenian dynasty but the Turks, according to Yeramian, either by force or by paying a small amount, managed to take ownership of these areas. Accordingly, the Armenians from these parts moved to eastern districts. As such, the eastern part of Aykesdan was formed having the Khachpoghan (the Cross street) as its center and was divided into 4 Armenian-populated districts: St. Hagop, Hayngoysner, Norashen, and Arark. It must be said that Armenian sources often use the name Aykesdan only in reference to the Armenian-populated districts. As such, the St. Hagop district, which is actually at the central part of Aykesdan, is presented (as we also read in Yeramian’s writings) as an area to the east of the Armenian Aykesdan. The central street of the St. Hagop district with its various parts is called the street of the Blue Cross, where during Yeramian’s childhood (born 1857) there also was a sanctuary . Each of the other Armenian districts had its own church and adjacent parish school. The expansion of the Turkish-populated neighborhoods was a continuous process, about which Yeramian also speaks. This process continued in the St. Hagop and Norashen districts for decades. Tapping into his memories, Yeramian says that he used to know about ten Armenian families who, under pressure, were forced to sell their beautiful homes and wide orchards for decimal values, and moved to the central or the eastern parts of Aykesdan. Under such conditions, Turkish families settled around the St. Hagop church and only a few Armenian families remained to the south of the structure . Concerning the issue of Aykesdan’s irrigation and vegetation, Yeramian writes: “The Aykesdan field initially had no water; therefore the new residents were forced to dig wells (kehriz) and surface dozens of springs to irrigate their young gardens and orchards. The poplar, plane, and willow trees planted in rows alongside the flow of these brooks gave the streets an air similar to that of European boulevards” . Aykesdan was famous for its plentiful apple, pear, plum, apricot and other fruits. 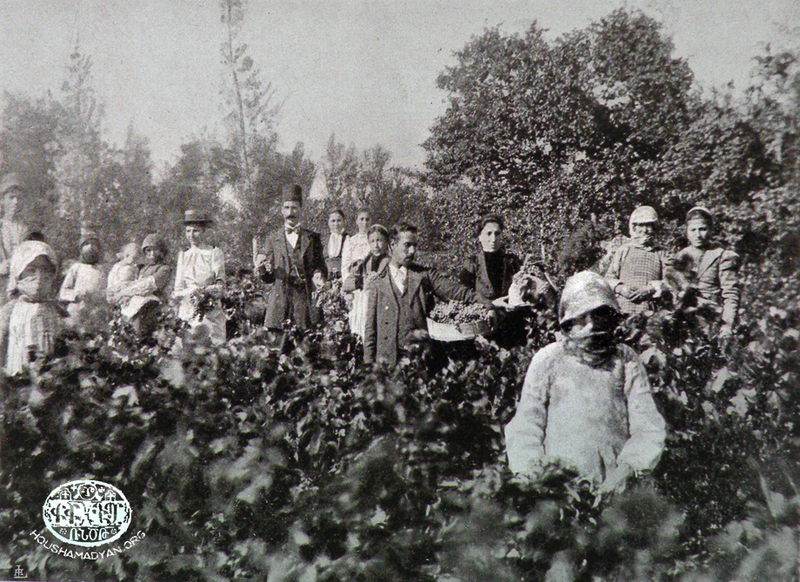 The grape was considered not to be very tasty but they used to produce fine wine from it . Between the fortress and the area to its east, there was an old Armenian cemetery, which in 1909 Ottoman authorities turned to the hurriyet meydan (Freedom Square). During the same period, construction works to lay a central street leading to the main city and Aykesdan, reveal countless human remains which Yeramian supposes are the remains of the people of Van killed during the Leng Timur invasion (14th century) . To the north-east of the city of Van, over a length of a kilometer on a 100-120 meter vertical cliff rises the citadel or the “fortress of Shamiram” with the remains of walls and other structures, cuneiform engravings and chambers carved in the cliff . The detailed description of this structure reaches us through the 5th century writings of Movses Khorenatsi and later on, at the beginning of the 19th century, Ghugas Indjidjian describes them in even more detail . A mountainous cliff emerges at the center of the City of Van, home to the Urartian Citadel. The citadel of Van, which is also known as Amarsdan, has rock carved barracks, armories, warehouses, staples, watch points and wide squares. 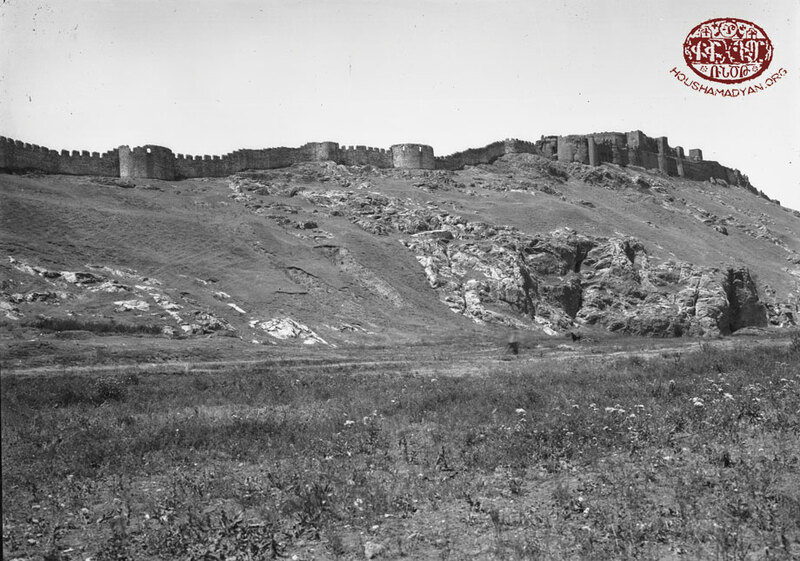 At the foot of the citadel extends the equally strong high wall with its adjacent defensive structures . The roads leading to the citadel pass through protective heights. The halls carved out of stone are square or rectangular; their walls have no decorations but are amazingly polished. Along the length of the walls are square recesses. Four entrances lead from the main hall to the side caves. A colossal staircase rises to the hall. The stone at the threshold of these hall-caves is covered with cuneiform engravings. The southern side of the cliff, which faces the city, is absolutely vertical but a staircase starts at the bottom of the cliff which leads to the stone carved chambers . Avedisian/Avedisian, Armenological …, p. 174. The concise Armenian encyclopedia, Yerevan, 2003, vol. 4 [in Armenian]; Sarkis Karayan,"Demography of Van Province, 1844-1914", in Richard G. Hovannisian (ed. ), Armenian Van/Vaspurakan, Mazda Publishers, Costa Mesa, California, p. 197-198. Karayan, "Demography of Van Province"…, pp. 198-199. Robert H. Hewsen, Armenia: A Historical Atlas, University of Chicago Press, Chicago/London, 2001; Raymond H. Kévorkian, Paul B. Paboudjian, Les Arméniens dans l’Empire Ottoman à la veille du Génocide, ARHIS, Paris, p. 513. Karayan, "Demography of Van Province"…, p. 198. 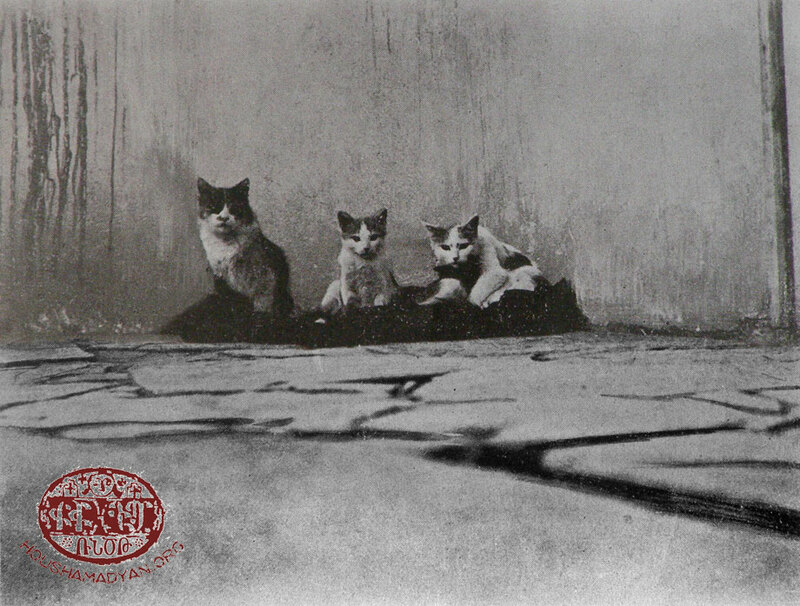 Avedisian/Avedisian, Armenological …, pp. 174-175. Kévorkian/Paboudjian, Les Arméniens…, pp. 534-543; Sevan Nişanyan, Adını Unutan Ülke: Türkiye'de Adı Değiştirilen Yerler Sözlüğü, Everest Yayınları, Istanbul, 2010. Hagopian, Historical Armenia’s …, p.236; TDANR, vol. 4, p. 748. Hagopian, Historicaal Armenia’s …, pp. 232-233; TDANR, vol. 4, p.748; Avedisian/Avedisian, Armenological …, p.176. Ibid.,p. 176; Srvantsdiants, Hamov-Hodov…, p.397. 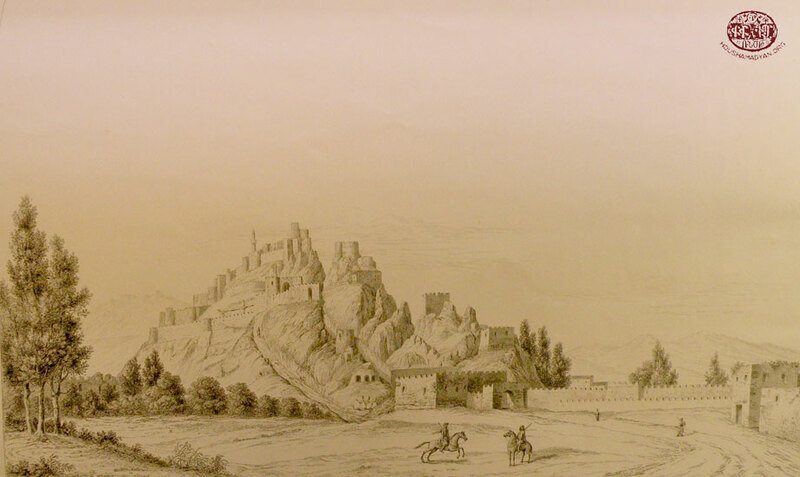 Hagopian, Historicaal Armenia’s …, p. 238. Srvantsdiants, Hamov-Hodov…, p. 397; Kévorkian/Paboudjian, Les Arméniens…, p. 517. TDANR, vol. 4, p. 748. Avedisian/Avedisian, Armenological …, p. 178. Srvantsdiants, Hamov-Hodov…,p. 396; TDANR, vol. 4, p. 748. Yeramian, Monument…, p. 37; TDANR, vol. 4, p. 748. Ghougas vartabed Indjidjian, Four territory world geography [in Armenian], first part, Asia, vol. I, Venice, 1806, pp. 138-139. Hagopian, Historicaal Armenia’s …, pp. 232-233; TDANR, vol. 4, p. 748. Do you have additions or objections to the information contained in this article?